Again, I have a question about the emotional side of this: Why would you “worry”, if temperature trends would change their sign? Is it because you like global warming an sich, or because you have invested so much intellectual capital in the warming scenario? 1998 was the hottest El Nino year on record. The trend is still up, not down or flat. You don’t know how to do a linear regression, do you? The sun is not the main climate CHANGE driver because it hasn’t put out significantly more or less sunlight in 50 years. And nobody can accurately forecast what the sun will do in the future. How many years would it take for you to question relativity, evolution, or the theory of gravitation? Carbon dioxide was shown to be a greenhouse gas back in 1859, by John Tyndall. The “Anthropgenic [sic] CO2 – warming paradigm” isn’t based on temperature trends, it’s based on radiation physics. Oh I agree that we’ll forget about climate change in our quest to keep our economy distorted by cheap energy. We will spend trillions of dollars trying to develop alternative energy sources so that I can buy tropical fruits more cheaply than local produce. The thing is, I think we will largely succeed. Not that we may not have some rather difficult and tense times for awhile. Golly, we might even have to raise fuel efficiencies an mpg or two as the (not so) Big 3 wail and gnash their teeth. But there is lots of fossil fuel out there, and it is owned by powerful interests, and it will be competitive with renewables, and people will panic about Peak Oil. Then we’ll have business as usual until A)all the fossil carbon is back in the atmosphere and we are back to Jurassic atmosphere, or B)it becomes obvious to even the most blinkered, self-interested, complacent food tube (since this seems to be who we elect) that we are altering the climate to our detriment. Alternative B) above would take something like a yearly visitation of a Cat 5 hurricane to Boston for a decade. I have tremendous faith in human ingenuity to confront and solve the problems we face immediately. I have zero faith in our wisdom to prioritize and look at resolving the problems we will face a decade or so hence. Norman Page, If the Sun dims (as it may, slightly), of course temperatures will not rise as quickly as they might otherwise. And if China spews gigatons of aerosols into the air, that too may slow warming for awhile. However, the solar output will increase eventually–on a timescale of decades. Aerosols will rain out of the skies eventually. And greenhouse gasses will still be there trapping IR radiation, and warming will return with a vengeance. CO2 stays in the atmosphere for hundreds to thousands of years. You contend warming has stopped. Yet we still see ice melting in record volumes in Greenland, the WAIS, and in the Arctic. That doesn’t sound like a cooling world to me. Norman, if you get past all the mechanisms and talk of blackbody and greybody radiation, the physics comes down to conservation of energy. Increasing greenhouse gasses decreases the energy that leaves the planet. That energy has to warm things up. I’m afaid it will take a lot of evidence before I give up on conservation of energy. There are already bioplastic products on the market. More coming soon. So I deeply doubt that lack of petrochemical feedstocks will ever be an issue. Gavin: Are you sure about this comment you leave at number 47? With 1998 remaining the record, and 2007 is the lowest since 2001 (UKMET) you certainly won’t have a positive trend (significant or not) in that record at least. While I agree with your comment that picking a single starting date is not good statistics, I am curious as to the meaning of your assertion, “You need a greater than a decade non-trend that is significantly different from projections.” One does need to start somewhere. Let me rephrase the question then. How long would it need to be for the 1998 record global temperature to not be exceeded (or if you prefer, a “non-trend” beginning at that date) for you worry that something has been missed in your understanding? 2010? 2015? 2020? 2030? A single year as an answer would be appreciated. I am simply curious and mean no disrespect with the question. OK, simply to clarify what I’ve heard from you. I am curious as to whether there are other simple variables that can be looked at unambiguously in terms of their behaviour over coming years that might allow for such explicit quantitative tests of understanding? …For years, Bush bristled privately at what he considered sky-is-falling alarmism by the liberal, elitist Hollywood crowd. The clatter over climate change, according to friends and advisers, seemed to him more like a political agenda than a rational response to known facts. But ever so gradually, they say, Bush’s views have evolved. He has found the science increasingly persuasive and believes more needs to be done, especially after a set of secret briefings last winter. A former aide said Bush’s staff even developed models for a market-based cap on greenhouse emissions. In fairness, it seems that you should also answer the converse question: how many more years of rising temperatures matching model predictions (when all factors such as aerosols, volcanic erruptions, and the like are included) would it take before you’ll consider that the theory does represent the real world? which I agree with completely. In view of #52 and Gavins’s reply we have to take Norman Page’s question as a hypothetical one rather than one based on the evidence so far. In that case the question should not be dismissed. The simple answer might be that the theory would have been falsified and goodness knows what might be wrong. That is what the Popperians claim could happen to any scientific idea. Is this relevant? Could it be relevant to the answer to #40? SLOPE gives you the simple linear regression slope. LINEST gives you the statistical measures. Do we – that is scientists – have a handle on the worst case rate of sea level rise. It seems clear that the science regarding melting of the Greenland and West Antarctic ice caps is still at an early stage, and that recent melting has been somewhat faster than predicted – predictions were essential based on thermal conduction models. Melting in fact seems to be accelerating. Is this the worst we can expect? I have seen estimates (I can’t remember where) of rates of sea level rise of 1 metre per decade. Such a rate would make adaptation challenging to say the least. Is it possible to place an upper limit on sea level rise (other than 70 metres by next Tuesday)? General: Again, a single example has many complicating factors: storm surge, tide, periodic increases in rainfall, etc. 40 & 56: Using 1998 as a starting point for trending recent temperatures might be cherry-picking, since 1998 was an El Nino year, but 2006 was also an El Nino year and there’s still a downward trend. Using the late 1970s as a starting point for a trend is cherry-picking, too, as it absorbs the AMO and PDO shifts into the equation. 52: Another way to phrase it: The sun drives climate; it does not drive AGW. I’m sorry for the sarcastic tone in my question. I just think it is not wise to attach much emotion into the success or failure of predictions. But then again, maybe it belongs to the scientific endeavor: understanding nature is a fine motive, but clearly second to the urge to belong to the group that was right. Thanks for the 1998-2012 prediction you made in comment 56. I’m sure it will be remembered. Let’s all hope (dispassionately) that Gavin and the whole RC group are indeed missing something. Dodo, I think that it may be you and others that are missing something. The greenhouse effect is established physics. The radiative behavior of ghgs is established physics. Even if we were to find some glaring omission in the models, it is unlikely that our understanding of the greenhouse role in climate models would be significantly changed. And since CO2 is the gift that keeps on giving–for centuries–in climate, at best this would delay the problem (a welcome event to be sure) rather than negate it. Indeed, the only way I could see out of this problem would be for there to be some sort of negative feedback that has not been taken into account, and the paleoclimate and other lines of inquiry provide no evidence for this. There simply is not much cause for hope that this problem will go away. VirgilM (in comment #30) made comments about the 1993 Midwest Flood. However the main point brought out in comment #5 was that the U.S. National Weather Service downplayed and kept climate change and global warming out of the U.S. local and national U.S. news for more than 13 years by their refusing to allow it to be discussed. Global warming was a serious concern to many scientists in before 1993, during 1993 and after. NWS staffers have had free access to climate and hydrologic records but NWS management forbid it’s staffers from using those records to tract regional changes in temperature and snowmelt runoff. NWS management downplaying and refusal to allow staffer research on climate and hydrologic change was severe, mainly behind the public eye. Although NWS staffers who spoke out skeptically on climate change and global warming were not punished the staffers who did the research and who tried to show their findings that regional climate and hydrologic changes were happening were punished severely. Getting back to the Thames barrier, I’m wondering if as scientists, the authors have sought detailed data with regard to the changed maintenance schedules for the barrier. There was a news item in the London press earlier this year about how the barrier had been raised more frequently, and how it had been linked to ‘Global Warming’ being an indicator of rising sea levels. An unscientific independent individual asked the operators of the barrier for comment on the increased raising of the barrier. They were able to explain it as implementation of a new maintenance policy only. Real Mechanics. However, the discussion in #66 about the 1993 Midwest Flood, which broke historical record crests by 5-6 feet after the levees failed may indeed be pertinent to Thames River flood frequencies and other flooding events involving heavy runoff from rainfall from the mid 1970s to recent, as part of a larger trend in mid-latitude Northern Hemisphere flooding due to increasing rainfall intensity. D.) 2000-2007 flooding: 2001 Upper Mississippi River flood (MN, WI, IA, IL), 2002 Illinois River flood, 2004 Illinois R basin (WI, IL), 2005 Illinois River January Flood, 2007 Upper Midwest Flash Flood (southeast MN, southwest WI). The Midwest has shown a trend in recent decades of increased storminess and increased river flow. Not having Thames river flow data back 100 years, I’m not able to comment specifically on Thames runoff. I have seen flow data for the last 100 years for several major rivers in the Upper Midwest which shows increasing runoff. Massive widespread levee failures and minimal changes in land use over the majority of the drainage areas indicate the increased flooding is being driven by climate change. The culprit is increasing rainfall intensity with increasing soil erosion. sediment into streams and lakes and reducing benefits to the land. Frequency of Extreme Rain Up 24% in U.S. I grew up in one of the areas you talk about – NE South Dakota. In the 1990s, I think last half, they experienced widespread ponding in low areas of fields. Many farms lost a great deal of land for the entire growing season. The state lost a lot trees to water damage. There was a French trading post along the James SE of our home where I used to hunt as a kid. It had huge trees. Almost all of them died in the continual flooding. Most of those ponds have since dried up. Thanks for reminding me of that. Severe flooding occurred in 1997 in both the James River basin in SD and the Red River basin in ND/MN in 1997, from snowmelt and rainfall runoff. Runoff from snowmelt and rain froze up by a cold spell in late March, then all H. broke loose with a rapid warm-up combined with additional heavy rainfall in April. Regions in Greenland and Antarctic will experience similar episodes of lull and gush of flows with ice break-up, as happened when Lake Agassiz, Pleistocene epoch, gave way. I don’t believe the paleo record really explains whether the current pattern will or will not generate negative or positive feedbacks or none at all. Something like a significant, positive feedback seems unlikely because climate never really warmed through the roof like you’d expect if there was a runaway effect – but of course nothing in the paleo record can really be compared with what we’ve got here today. From my (climate) layman perspecitive, the long-term temperature record rather points towards positive feedbacks and a small reversal sensitivity on cooling and no feedbacks plus a bigger reversal sensitivity on warming – but the curves I usually look at describe mechanics, not temperatures. [I’m afraid this table may not transfer clearly – first column is year; second closures against tide; third, closures for fluvial retention; last, total]. The reference to “tidal” closures are where the barrier was closed to prevent flooding or overtopping of the defences upstream of the barrier. The “fluvially dominated” closures refer to occasions where closing the barrier has stopped the tide and allowed unhindered fluvial/rainfall flow to continue over Teddington Weir, which has thereby reduced the risk of flooding just upstream of the weir. [Therby leaving the reach between Teddington and the barrier as a temporary reservoir]. Simon Cox and Richard Vadon, BBC Radio 4, ‘The Investigation of the Stern Report’ BBC radio 4, 20:00 25th Jan. 2007. In the program, it was stated that the Thames barrier had to be raised 55 times in the past five years, as opposed to 12 times in the previous five years, supposedly indicating the ever increasing threat of raised tide levels associated with ‘Global warming’. The investigator then visited the barrier and interviewed the man in charge. They had been raised 31 times in the last five years, and 35 in the previous five, he claimed no knowledge of where the other figures may have come from. During November 2007, the barrier was raised three times (it is raised on average 5 times a year). 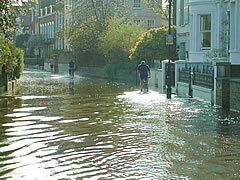 In London, records show that the high water level at London Bridge has risen by about 75cm each century. Locally, the British Isles is tilting towards Europe, causing the south of England to sink at an estimated rate of 30cm per century. This is a natural geological process, also contributing to rising river levels in the Thames. First off, congratulations on all the awards you received as an employee of a NWS River Forecast Center. Hydrology is not simple in Minnesota and Eastern North Dakota and there have been some challenging events during your career. That is quite the bold prediction. How has the level of Devils Lake done since 2000? It has been seven years, since you made this prediction. Granted, you may be eventually right, but the people who live near Devils Lake wouldn’t think you have any credibility given that the levels of Devils Lake have hit record or near record highs each of the last 6 years. Many NWS offices are wise in not wading in the climate change waters too deeply. The NWS wants the public to trust them, instead of enguaging in wild speculation. From experience, I know that Eastern Montana climate has its roots in the equatorial pacific. ENSO, MJOs, and so forth. Even typhons that track north by Japan into the Aleutians changes the weather patterns over Montana. The latest IPCC report admits that the models are split on the ENSO trend. If it is towards La Nina, then Montana will see more drought. If it is towards El Nino, then Montana will see more wet periods. Hell, another climate paradigm could evolove over the Pacific that changes how El Nino and La Nina affects weather patterns over the west. The NWS office in my area doesn’t want to speculate on this topic. Isn’t okay to say “I don’t know?” The NWS can and should present to the public what has happened in the past in terms of drought and floods and encourage stakeholders to prepare in advance. I cannot comment on what definition you have of tidal or fluvial, as it is not given. So, 19 it was in the space of one month, but note the reasons in the last sentence above. It is not widely realised that a river in full spate has a considerable gradient between weirs, and any obstruction or impediment to flow will cause levels up-stream to be higher. It is for this fluvial reason that the barrier is raised under such circumstances, even against moderate tides, enabling the run-off more room between Teddington and Gallions Reach in which to flow. Actually, we know that there are significant positive feedbacks having to do with planetary albedo (melting of ice and snow, changes in vegetation) and release of more greenhouse gasses. The latter in particular are a serious concern in that they take away from us the only real handle we have on limiting the warming that does occur. Keep in mind that we are at CO2 levels that have not been seen in at least 800000 years, and quite possibly many millions of years (after all, that carbon has been sequestered in that coal and oil a long time). And we show no sign of seriously modifying our behavior. Midwest flooding, if the Missouri is representative, doesn’t seem to be significantly worse or even as bad since 1970 as it was earlier before GW “showed up”. Only 1993 surpassed a near half-dozen floods since mid-1800s, and there’s a difference of opinion of whether 1993 was worse than 1952. It seems much statistics about nothing. A mighty big “if” Rod. The West where the Missouri begins has been suffering from a severe drought during much of the past decade or so. Also keep in mind that many towns were rebuilt further from the river. Did you account for the wetlands zoning keeping development out of some floodplains, and on the work of the Corps of Engineers? If that’s hard to do, it might be useful to look for data sets on streamflow in undeveloped watersheds, and precipitation information of any sort that’s not likely changed by big flood control projects. … the amplitudes were particularly strong after 1980. Peak flow due to snowmelt, typically the highest flow in each year, appears to be the only streamflow statistic that has not changed at a significant rate. Peak flows due to rainfall events in the summer are increasing, as well as the number of days with higher flows (high flow days). Increases in low flow (base flow) in summer and in winter have been significant. Wetter summers and more frequent snow melt events due to warmer winters are the likely cause. Stream flows in Minnesota reflect observed changes in precipitation with increases in mean annual precipitation, a larger number of intense rainfall events, more days with precipitation and earlier and more frequent snowmelt events. For water resources management the results suggest that the threat of snowmelt flooding has not increased, but floods due to rainfall events are more likely…. VirgilM mislead readers in his comment in #78 regarding the elevation of Devils Lake in ND, which feel from an annual peak level in June of 2007 (1447. 9 ft) to the current 1446.8 (0.6-0.7 ft below crest levels shown in his table from 2001-2006. The lowering of Devils Lake is indeed happening as is the lowering of the Great Lakes since 2000. In the 1950s they began building several dams along the Missouri in the Dakotas. Among other things, they were intended to help control flooding. Most, if not all of them, were built after the 1951 flood, which held my mother’s new piano hostage in Kansas City. The last interglacial period, Marine Isotope Stage (MIS) 5e, was characterized by global mean surface temperatures that were at least 2 °C warmer than present1. Mean sea level stood 4–6 m higher than modern sea level2, 3, 4, 5, 6, 7, 8, 9, 10, 11, 12, 13, with an important contribution from a reduction of the Greenland ice sheet1, 14. Although some fossil reef data indicate sea-level fluctuations of up to 10 m around the mean3, 4, 5, 6, 7, 8, 9, 11, so far it has not been possible to constrain the duration and rates of change of these shorter-term variations. Here, we use a combination of a continuous high-resolution sea-level record, based on the stable oxygen isotopes of planktonic foraminifera from the central Red Sea15, 16, 17, 18, and age constraints from coral data to estimate rates of sea-level change during MIS-5e. We find average rates of sea-level rise of 1.6 m per century. As global mean temperatures during MIS-5e were comparable to projections for future climate change under the influence of anthropogenic greenhouse-gas emissions19, 20, these observed rates of sea-level change inform the ongoing debate about high versus low rates of sea-level rise in the coming century21, 22. I posted a table from the supplimental information of this paper as commetn #122 on the Hot off the projector #3: Atmospheric CO2 to 800 kyr ago thread. http://www.grha.net/river_study/pinter2.pdf is a study that shows changing channel conditions is probably the largest factor in recent increases in flood stages, for the Wide Mo. at least. But it could prove either way over time, I guess. I would simply suggest keeping an eye on (and mentioning it is certainly O.K.) but holding the gilding off loosey-goosey statistics to come up with a smoking-gun proof of GW. CLEVELAND — The newest update to a Lake Erie management plan predicts global warming will lead to a steep drop in water levels over the next 64 years, a change that could cause the lake’s surface area to shrink by up to 15 percent. The drop could undo years of shoreline abuse by allowing water to resume the natural coastal circulation that has become blocked by structures, experts said. Updated annually, the plan is required by the Great Lakes Water Quality Agreement between the United States and Canada. It is developed by the U.S. Environmental Protection Agency, Environment Canada and state and local governments with help from the shipping industry, sports-fishing operators, farm interests, academics and environmental organizations. The newest update addresses for the first time, when, where and how the shoreline will be reshaped. It says the water temperature of Lake Erie has increased by one degree since 1988 and predicts the lake’s level could fall about 34 inches. It also says the other Great Lakes will lose water. If the projections are accurate, Lake Erie would be reduced by one-sixth by late this century, exposing nearly 2,200 square miles of land and creating marshes, prairies, beaches and forests, researchers said. Researchers said new islands are appearing in the western basin, where Lake Erie is at its lowest and some reefs are about 2 feet below surface. A predicted drop in water levels also has been addressed by the International Joint Commission, an American-Canadian panel that controls water discharges out of Lake Superior and the St. Lawrence River. The commission told scientists at a workshop in February that research showed water levels should begin decreasing before 2050. The report was written in an effort to spark thought about what the shoreline could become, said Jan Ciborowski, a professor at the University of Windsor who specializes in aquatic ecology and also helped write the plan. “There is a lot of opinion among scientists who study the Great Lakes that we need to get the public to start thinking: ‘What are things going to look like?”‘ Ciborowski said. The plan monitors issues ranging from pollution to invasive species, said Dan O’Riordan, an EPA manager at the Great Lakes National Program Office in Chicago. He said the agency recognizes the views of experts who predict the lake will shrink. “They’ve done the math; I would trust the math,” he said. Changing channel conditions and land uses change were not factors in the devastating Aug 2007 flash flooding, which led to six deaths in southeast MN, from a 24 hour MN state record rainfall of 15.1 inches near Houston, MN – most occurring in less than 12 hours. The culprit was the high volume of precipitation and the high rainfall intensity which pounded the soil and all ran off. Re:16 Gavin, Thats what frustrates me no end as well. For some unknown reason so many people like to hammer the life out of one very small irregularity hiding amongst a whole ocean of corroborative evidence supporting ACC and glacial melt. I have surfed a great many web sites re: Glacial melt and have only seen what you have researched yourself..that glaciers are retreating all over the world with the greatest and most obvious retreat amongst the tropical glaciers. With by far the greatest rate of retreat occurring in the last 20 years and accelerating. If that isn’t concurrent with a nett global increase in land/sea temp..I’ll eat my hat! What these idiots are effectively saying is that an elephant isn’t an elephant because it happens to have pimple behind it’s left ear..c’mon get real and stop wasting our time!! There is an important social principle that is currently being violated by many manufacturing activities: the principle that, while engaged in a profit-making activity, one must not leave a mess behind for the rest of society to clean up. This principle is understood in a societal context as common decency, but is continually breached in our economy to such an extent that nobody even objects! The easiest example is that of mineral water and soft-drink manufacturers, who sell a product that results in a consumer who usually discards a non-biodegradable PET bottle into the environment in an unregulated manner. We should mobilize citizens to demand legislation that every manufacturer must repurchase/collect and recycle as many tonnes of raw material as he uses on a week-by-week basis. For example, if a mineral-water manufacturer uses ten tonnes of plastics per week to manufacture bottles, he MUST buy back ten tonnes of plastic scrap and safely recycle it. The same goes for automobile manufacturers, who must buy back that many tonnes of metals, plastics, glass etc. every week, and find ways to recycle them. The cost may be met by raising the market price of their product… but the responsibility to make the recycling activity happen MUST be fixed on the manufacturer of every product. The same goes for manufacturers of tyres, batteries, plastic goods, newspapers, clothes, chemicals, auto-lubricant oils, etc. The list is long. And if this makes some manufacturing and marketing processes unviable, it means that their economic activity was unviable in the first place, and was sustainable only by passing on hidden costs to the environment, to society, to consumers etc ! What say? I would appreciate detailed responses to this idea. I’m not sure who said that the majority of glacial ice on Mt Kilimanjaro retreated in the first half of the 20th century because I’ve just looked up google earth and the furtwangler glacier specifically and half of it has disappeared since 1976 but if all this person can do is spout totally fictitious information he better look for a more appropriate career in fantasy writing. May I say that the kilimanjaro glaciers now look pretty sick and pathetic than the majesty and awe they once commanded. Find Kilimajaro on google earth at coordinates 3deg 03min 42.36sec S and 37deg 21min 07.93sec E. Very sad!. The facts remain that the highest crest recorded was recorded in May 2006. A have a neighbor who have relatives in Devils Lake, ND and she confirms that the rising lake levels is causing problems around the area. The denialist blogs fail to mention the Mote then says that Kilimanjaro may be the ONLY example of retreating glaciers that isn’t related to climate change. Again, typical denialist tactic: focus on one isolated factoid and only tell half the story wrt that! Two more links to back my contention that Devils Lake has risen after year 2000, instead of lowered as Pat Neuman cliams. If it was falling, then why is North Dakota trying to build an outlet from the lake to the Red River? I have a simple question, a bit unrelated, but this thread is still being looked at (and is relevant to impacts, and is a barrier to my understanding). If the greenhouse effect contributes 33 K and 150 W/m^2 of atmospheric absorption, then why can’t you just divide 33/150 to get the K/W/m^2 so that you know the temperature response for a given RF? IT also seems like 1.6 W/m^2 compared to the 150 is small, but how do you get a 1.2 K rise + feedbacks, if 150 W/m^2 gives 33 K rise? I travel back to the Dakotas about twice a year, at Christmas and in the summertime, and have done so since the 1970s. From my viewpoint the climate in the Dakotas is much different than it was when I grew up there in the 1950s and 1960s. The winters are less severe; they seem warmer and there appears to be less snowfall. The summers seemed to be about the same until all the water showed up in the 1990s. I don’t know how to sift through what is caused by natural variation and what, if any, is caused by AGW, but I think he new warmth is probably a factor. Thanks again. Would you have anything I could read on that? I’ve never seen the 170 number before- I looked it up quickly and am just finding stuff on the absorbed shotwave at the surface. I guess I’m still confused on the temperature response to that, and how you get, say, 16 Wm^2 (20-4) from feedbacks but the temperature only goes up by a factor of around 2.5. IS there any literature on this that I could look at for further clarification, because I feel funny playing student here, dont want to take up people’s time. One last question though. From 6.2.1 in the TAR, the climate sensitivity paramter is 0.5 K/W/m^2; in your article on “CO2 problem in 6 easy steps” it is 0.75 K/W/m^2. Is this improved understanding from the TAR or more confusion by me? You need to mention all the snow and ice that we are currently experiencing here in New England more often. Do you think, for example, that a few storms will save (or bring back) Southern New Hampshire’s ski resorts. Or will save skiing elsewhere in new England, or maple sugar, or the old-style fall foliage season? Global warming already affecting New England, June 5, 2007. If you do think so, why do you think people going out of business due to warming and less skiing days *don’t* think so? Oh my God! How could we ignore the fact that AGW can’t be real because WE STILL HAVE WINTER!!!! Just look out your window, climate science is a fraud!!!! Get a grip, dude, and do some exploratory reading before posting something as silly as that.